President Chavez had an historic opportunity after the recent referendum to take Venezuela in new direction. He could have used his position as the constitutionally elected leader to embrace respect for democracy and the rule of law at home and throughout the region. Unfortunately, he has gone in the opposite direction. President Chavez declared after the referendum that he was ready to work together with the peaceful opposition. Instead, he has chosen to prosecute some members for the "crime" of accepting a small grant from the U.S. National Endowment for Democracy to promote the referendum. President Chavez should immediately stop these politically-inspired prosecutions and begin fulfilling his promise to move Venezuela forward to a truly democratic future. And we should work with our regional allies to make clear that the world will be watching. Now, this is quite something, even if he is desperately trying to get a few more Hispanic votes in Florida. Q: Libya and Venezuela are both important oil-producing nations. What's going to happen there? A: [snip the Libya part] In Venezuela, I can't make that argument. I think President Hugo Chavez is a real problem. I think he will continue to find ways to subvert democracy in his own country. He will continue to find ways to make his neighbors miserable. He will continue his contacts with Fidel Castro, maybe giving Castro one last fling to try to affect the politics of Latin America, which is not a good thing. He's involved in ways in Colombia with the FARC (Marxist rebels) that are unhelpful. The key there is to mobilize the region to both watch him and be vigilant about him and to pressure him when he makes moves in one direction or another. We can't do it alone. This is a region where if we try to do it alone, we actually probably strengthen him. But the OAS (Organization of American States) can do a lot. We're hopeful that the recognition that he's not following a democratic course will help mobilize the OAS to do that. They have done it before -- with Peru they did it. Watching his activities and making it costly at least politically for Chavez to carry out anti-democratic activities either at home or in the region is really about where we are. But the reflection goes further. In a serious democratic system, no matter what its flaws are, there are a minimum of consensus that are reached between all the parties. Arguably the current US campaign is one of its bitterest, and yet, yet!, one can surmise that the people behind the stage are working together to make sure that whoever becomes the next president there will be a blueprint reflecting the National Interests waiting on his desk at inauguration day. This type of consensus is found in other countries with even deeper divisions. For example in France, Socialists and Liberal Right parties share the notion that French foreign policy can only be made upon a basic agreement with Germany, no matter the squabbling on Weiss Beer and Camembert. Germans in turn all worry about their Eastern borders. Polish parties have all tied their lot with the US. Even in South America some examples are found. Brazil political parties all support Mercosur, more or less but all support it. They all support Fidel Castro too as both Cardozo and Lula made the pilgrimage to Havana. In Venezuela this is not the case. The opposition is not consulted on foreign policy. Period. Something that was done in the past, even though the president had the final word. Actually, it seems that Chavez only consults Castro on his foreign policy... This is rather grave because it actually allows foreign interests to sneak one way or the other within Venezuela, either flattering Chavez and sponsoring corruption to gain advantages, or by stirring the opposition into trouble if they do not get what they asked Chavez to give them. 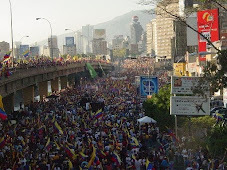 It is also very dangerous for countries and particulars trying to make deals with the Venezuelan government. Chavez could slip in his bath tub tonight and die, and a new government will feel no obligation to fulfill obligations contracted by Chavez. It will be very easy for such a new administration, that could even come from Chavez file and rank, to find all sorts of compromising evidence to back out of any given deal. Only when the basic tenets of foreign policies are shared, when the National Interest is above the personal interest, can a country offer a coherent and respected foreign policy. When that does not happen, then our principal commercial partner is found unanimously criticizing us.